Hiring managers are increasingly confident in the accuracy of their decisions. This has fostered stronger ‘buy in’ to the PDP program. 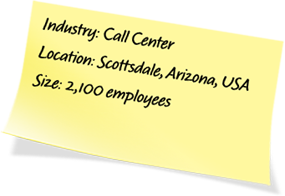 Within the past year, a Scottsdale, Arizona-based international call center has attracted 14,000 potential employees. As part of the online application, each individual completed the PDP survey, providing the Job Model Applicant Report for Job Model matching. This outsource call center is a large, multi-site organization. Its employees provide sales, customer service, and technical support to the customers of numerous Fortune 500 telecommunications companies. During the past year, the company experienced phenomenal growth, adding 4 new sites and increasing the number of employees from 1200 to 2100. As success brought in new clients with different objectives, the established recruiting process was no longer optimal. The recruiting staff could not keep up with the demand for skilled employees. The hiring process took too long. New hires did not have the right strengths, and turnover was too high. Supervisors were discouraged by the quality of candidates presented for initial interviews, and resisted the frequent interruptions required to conduct interviews. The company took a two-prong approach to the challenge. With the assistance of the PDP Representative, the company developed job models to describe the ideal candidate for each of their project types (e.g. Customer Service, Inbound Sales, Technical Support). Top performing employees completed individual surveys, and veteran supervisors completed JDA’s to develop a comprehensive job model. These job models were then tested against current employees who were known to be top performers as well as lower-performing employees. In a blind test, the PDP Representative was able to identify the lower-performing employees from the job match score, validating the job models. The company also developed an online application that linked with a web-based applicant tracking system (HR Central) to reduce application processing time. This online application linked to the PDP survey and made the survey a mandatory element of the application process. The company’s recruiters were then able to “screen in” applicants with a 75% or greater match to the job model. This screen in process brought in applicants for interviews who would not have otherwise been considered based on a resume scan. The company also integrated targeted interview questions based on the job model profiles into the interview process. These questions were well-received by the interviewing supervisors and bolstered support for the recruiting process.